First Lord Of The Admiralty At Home. Mr Winston Churchill enjoying a leisure moment in the library of his home. During his 2017 lecture at Philadelphia Youth Camp, Gerald Flurry challenged our teenage children to learn more about the outstanding World War ii leadership of Winston Churchill. 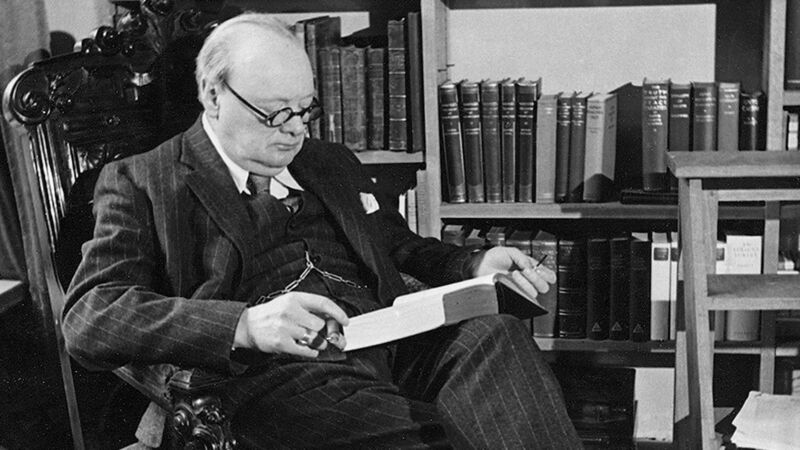 He also encouraged them to study William Manchester’s three-volume biography on Churchill, The Last Lion. Manchester’s work, my father said, captures the drama of Churchill’s life better than other biographies: He understood and emphasized the momentous impact Churchill had on Western civilization. Winston S. Churchill was the greatest statesman of the 20th century! Young Winston was a miserable failure at school. But he was ambitious enough to try for Sandhurst, the British Army’s officer training academy. He failed the entrance exam twice, hired a “crammer” to help him study, and barely made it in on the third try. His marks were too low to be admitted as an infantry cadet, but he was accepted into the cavalry—and he was ecstatic! After his acceptance to Sandhurst, Winston wrote to his father, whom he had yearned to know and to please, “I was so glad to be able to send you the good news.” His father’s response was extraordinarily cruel. Winston was devastated by his father’s condemnation. “I am very sorry indeed that you are displeased with me,” he wrote. He said he would work hard at Sandhurst and that hopefully his father would “modify” his opinion at some point. His father didn’t live long enough to alter his view. Winston, on the other hand, went on to live a hardworking, useful, profitable life, to say the least. And he cherished his father’s memory. As a young man, he devoted three years of his life to writing a glowing, two-volume biography about his father—a nonexistent dad who shipped little Winston to boarding school when he was just 7 years old and actually worked to avoid his son for the rest of his life. Winston’s parents may have neglected their unique son, but God the Father did not. As my father told the teens at youth camp, it was God who sent a woman named Elizabeth Everest to look after Winston during his childhood. She was an affectionate nanny who tended to all of Winston’s needs. The significance of her role in Winston’s upbringing cannot be overemphasized. She was the only person in Winston’s childhood who loved him unconditionally. At the youth camp, my father told the teens that if God can intervene to work with a difficult, unhappy youngster and later use him to save the Western world, He can do amazing things with young people who turn to Him! God can, and will, make you great—if you will look to Him as Ruler and Educator and if you are hungry for wisdom and understanding. At Harrow (the school he attended before Sandhurst), young Winston also benefited from Robert Somervell’s English class—a remedial course, at that. This was a class for students who were “too simple” to learn Latin and Greek. It was in Somervell’s class that Churchill developed his lifelong fascination with English words. Churchill wrote, “I got into my bones the essential structure of the ordinary British sentence—which is a noble thing.” Later, when admitted to Sandhurst, Churchill was able to delve into other fields of knowledge that he was interested in, like military history and strategy. Churchill graduated from Sandhurst—with honors—and was commissioned as second lieutenant in a British Army cavalry regiment. At the age of 22, while stationed in India, Winston still felt like he lacked “even the vaguest knowledge about many large spheres of thought.” There were no headmasters, trainers or crammers prodding him to study, yet once he had finished his military responsibilities for the day he studied great works of history, philosophy and economics—for four to five hours. “I devoured Gibbon,” he wrote. “I scribbled all my opinions on the margins of the pages.” He also idolized English historian Lord Macaulay. Every day while in India, he aimed for 50 pages of Macaulay and 25 pages of Gibbon. Winston had problems in school—but he did not have problems with learning. He was an ambitious young man who wanted to make a difference for his nation. That meant he had to be a voracious learner. He had problems with his upbringing—but he did not have problems with his destiny. He rightly believed that he would go on to change history. But he never would have changed the course of history if he didn’t put in the hard work. His vision of his future would have remained a vision. And Britain would have fallen. Years later, God would miraculously use Winston Churchill to do nothing less than save Western civilization. But He could only do it because Winston was visionary enough, hard-working enough, relentless enough, passionate enough, bold enough and self-educated enough to be used by Him. Many of us have heard the name Winston Churchill listed among the greats. We have a general sense of who he was and what he did. But the trials, the character traits, the self-education and the rest of his God-guided life really does bear deeper study—for those of you who, like him, want to change the course of history.